Appearance: The was scepter is a straight staff with a forked base and topped with an angled transverse section. The top of the staff was often shaped as the head of some fantastic creature, perhaps the bennu bird. Originally, the was scepter may have been a fetish associated with the spirit of a sacred animal, or perhaps it was simply a herdsman's staff. Meaning: The was scepter was a visual representation of the concept of "power" or "dominion." Naturally, its earliest depictions in Egyptian art found it in the hands of the gods and goddesses. The scepter was often also carried by the pharaohs. In later periods, it was sometimes shown in the mortuary portraits of private persons. 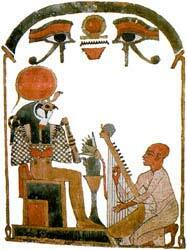 To the right, a harp player performs for the god Horus who is seated inside a shrine. The shrine's roof is upheld by was scepters. Variations on the was scepter were found in the hands of Osiris and Ptah. In their hands, the was scepter was combined with the ankh and djed.